Series refers to a series of data points displayed in the chart. The RadChart Series object is a collection of ChartSeriesItem objects. The number of series used depends on the type of chart. A Pie chart type only uses a single series. "Stacked" charts like the Stacked Area chart use several series. Each ChartSeries object contains a collection of ChartSeriesItem objects that contain the actual data points displayed on the chart. You can add data to a series programmatically at run time, at design time in the Properties Window of Visual Studio, declaratively in the ASP.NET HTML markup, or by binding to a data source. Appearance: This property contains the common appearance related properties such as Border, Corners, FillStyle and TextAppearance.In addition there are series specific properties including LabelAppearance, LineSeriesAppearance, LegendDisplayMode, BubbleSize and PointMark. Items: The collection of ChartSeriesItem objects that contain data points. Name: By default this name is displayed in the legend for the series. Types: Use this property to select the chart type.Valid values are Bar, StackedBar, StackedBar100, Line, Area, StackedArea, StackedArea100, Pie, Gantt, Bezier, Spline, Bubble, Point, SplineArea, StackedSplineArea and StackedSplineArea100. Visible: Turn this property off to hide the series. 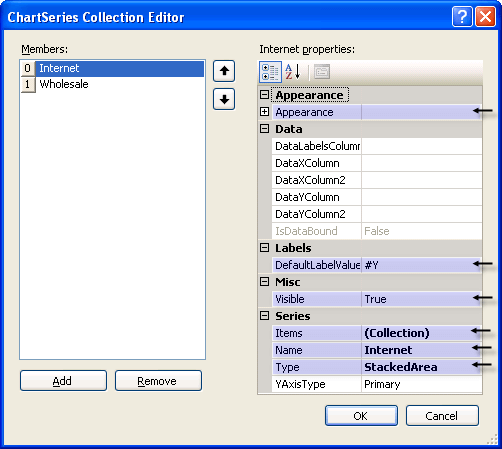 DataLabelsColumn: This is the name of a data source column that will supply the text that displays next to each data point in the chart.DataXColumn, DataXColumn2, DataYColumn, DataYColumn2: These are the names of the columns that will contain data used for the series item XValue, XValue2, YValue and YValue2 columns respectively.